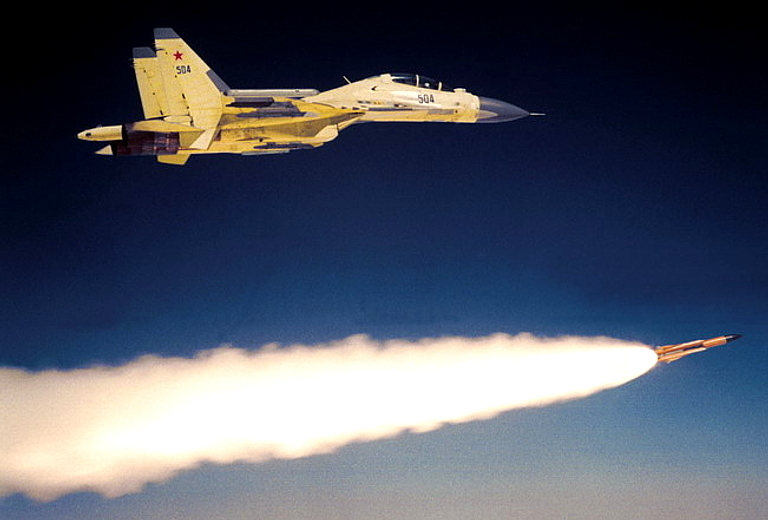 KTRV Kh-31P / AS-17 Krypton anti-radiation missile being launched by an Su-30MK Flanker G (KnAAPO image). The Soviet FA-VVS or tactical air forces were tasked with providing air support for Soviet land force formations, and protecting them from hostile air attack. 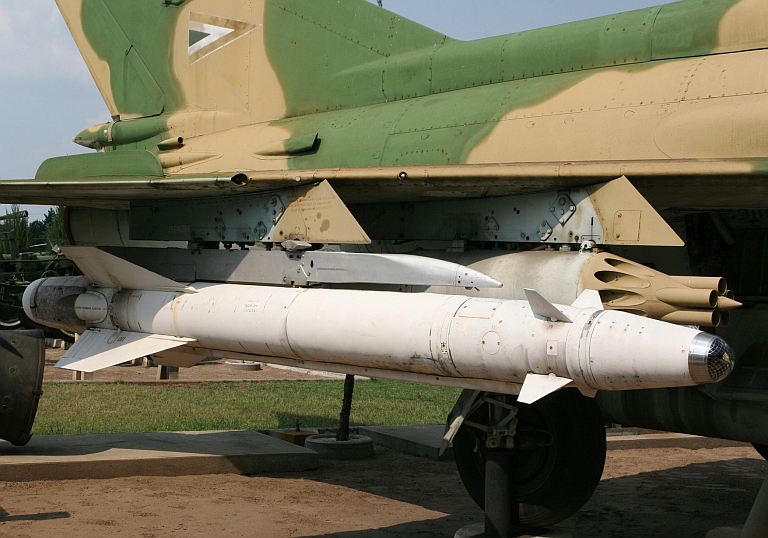 Most of the guided missiles developed by the Soviets during the Cold War were developed for Frontal Aviation forces. In perspective, what is most apparent about Soviet tactical ASM development during this period is the split focus between precision guided missiles intended to bust fortifications and opposing ground forces, and anti-radiation missiles intended to bust NATO air defences. These two categories are the most strongly represented. The technological strategy pursued by the Soviets varies widely. Some weapons are unique Soviet designs, adapted or evolved from other designs, some are unique original, and some like the Kh-58 can only be described as copies of Western equivalents. Contemporary Russian tactical ASMs reflect this heritage, and most use the airframe and propulsion systems of their Soviet predecessors, albeit with incremental technological improvements reflecting two decades of elapsed time. More interesting has been the infusion of digital technology into missile guidance systems, and increasingly, replacement of Soviet era electro-optical and radar technologies in seekers. Many weapons are unique, such as the impressive Kh-31 / AS-17 Krypton, which has evolved into multiple roles. Similar evolution has been seen with the Kh-59M / AS-18 Kazoo, and Kh-25M / AS-10 Karen. The trend for the future is likely to mirror developments in the West, with progressive improvements in seeker technology, especially the introduction of MMWI and focal plane imaging devies, digital guidance, and increasingly, the exploitation of satellite navigation technology to enhance existing munitions. The Kh-23 / AS-7 Kerry was an equivalent to the AGM-12 Bullpup and led to the development of the Kh-25 Karen/Kegler family of weapons. This example is on display at Kecel in Hungary (© 2009, Miroslav Gyűrösi). The Soviet military industrial complex was scattered across virtually all republics which had a well developed industrial base, and many which did not. Key manuafacturers of missile components, especially guidance systems and subsystems, were located across the RSFSR (Russia), the Ukraine and Belarus. After the fall of the Soviet Union, this collaboration continued by necessity. A major upheaval developed in 2004 when the Ukraine split away and was effectively embargoed by the Russians, resulting in the loss of key capabilities in both design and manufacture, which were located in the Ukraine. Many are being reconstituted in Russia, for instance Geofizika is re-establishing production of infrared missile seeker technology previously manufactured by Arsenal in the Ukraine, who are now effectively bankrupt as Russia is no longer purchasing their seekers for use in AA-11 Archer missile production. 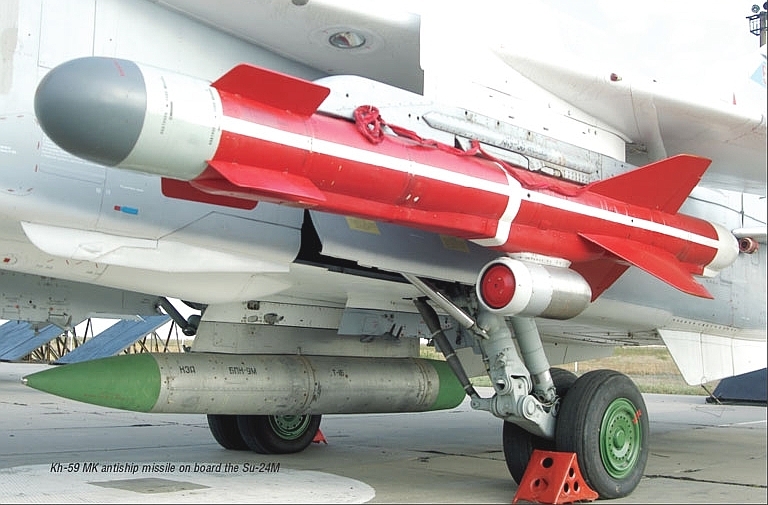 In tactical guided weapons the principal impact was produced by the loss of the Lviv based Tekon/Elektron, which designed and manufactured the Tubus-2 series stabilised television seekers used in the Kh-29TE / AS-14 Kedge, Kh-59 Ovod / AS-13 Kingbolt, Kh-59M Ovod M / AS-18 Kazoo and key components of the associated APK-9E datalink pod. It is not clear whether the Russians will attempt to reconstitute this capability, or develop entirely new replacement products. In this respect the global transition from thermionic imagers to CCDs may well dictate new designs, but none have been reported as yet. Belorussia's Peleng is offering a replacement TV seeker design. The KB Tochmash / Nudelman S-25L series are large calibre tube launched 400 kg folding fin rockets, with terminal guidance seekers to provide a precision weapon for close air support and battlefield interdiction operations. Two basic variants exist, the S-25L and improved S-25LD, both with the KBT 24N1 gimballed semiactive laser homing seeker used in a number of other weapons. KBT have also adapted other seeker hardware and developed an infrared homing seeker variant, the S-25IRS, and a television seeker equipped variant, the S-25TV. Phazotron have also offered an active radar homing seeker for the weapon. The laser guided Kh-25L/ML is one of the most widely used close air support weapons in the Russian inventory (Wikipedia image). 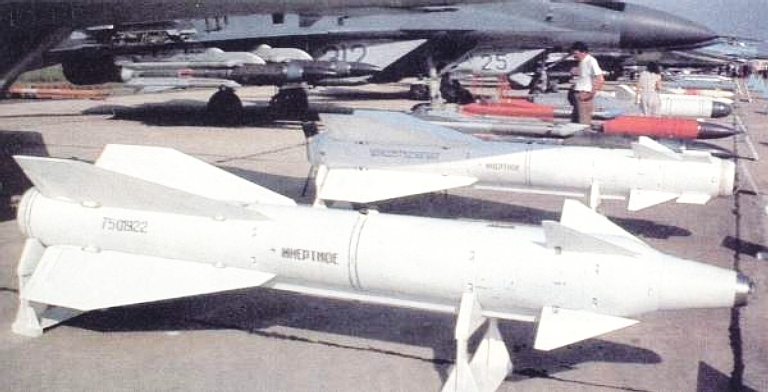 The versatile Kh-25 / AS-10 Karen family of missiles was developed to replace the earlier Kh-23/Kh-66 / AS-7 Kerry, itself developed as a counterpart to the US AGM-12 Bullpup series. Like the Bullpup the Kh-23/Kh-66 suffered persistent difficulties with its cumbersome radiofrequency guidance system. 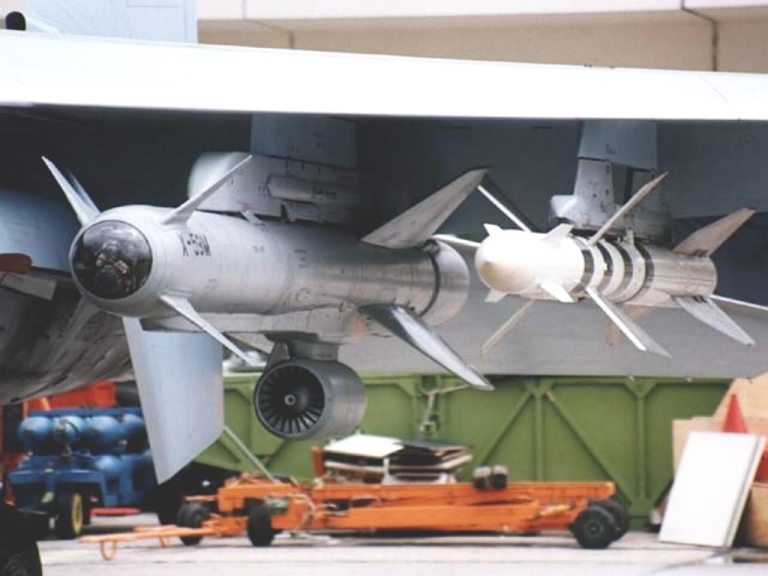 The Kh-25M / AS-10 Karen was designed around the model of interchangeable homing seekers, making it a defacto equivalent to the ubiquitous US Hughes (now Raytheon) AGM-65 Maverick missile. The missile uses canard controls driven by a common SUR-73 guidance and control module. The PRD-276 solid rocket motor exhaust is via paired nozzles on the aft fuselage, permitting the installation of a tail antenna aperture for datalink equipped variants. The motor has a two phase boost/sustain burn profile. Kh-25ML on display at Kecel in Hungary (© 2009, Miroslav Gyűrösi). 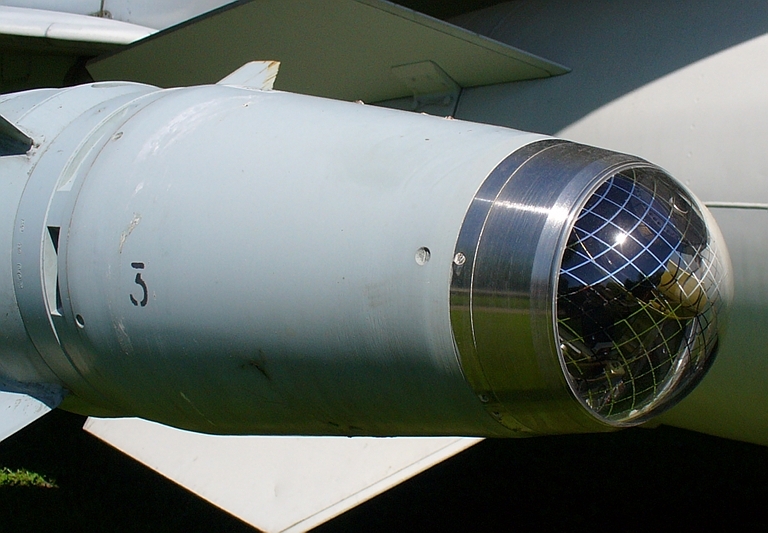 The Kh-25ML is fitted with a 24N1 series semi-active laser homing seeker. It is used primarily to destroy hardened battlefield targets like fortifications, bunkers, or armour. Achievable CEP is cited at 4 metres. The F-27 warhead has two components, one in the centre fuselage, and in the otherwise unoccupied tail section aft of the nozzles. The 24N1 seeker has an IFOV of 2º and a Field of Regard of 30º. A proportional navigation control law is used for terminal homing. Post launch the autopilot is programmed to fly a climbing trajectory to preclude the missile exhaust obscuring the target view from the launch aircraft. 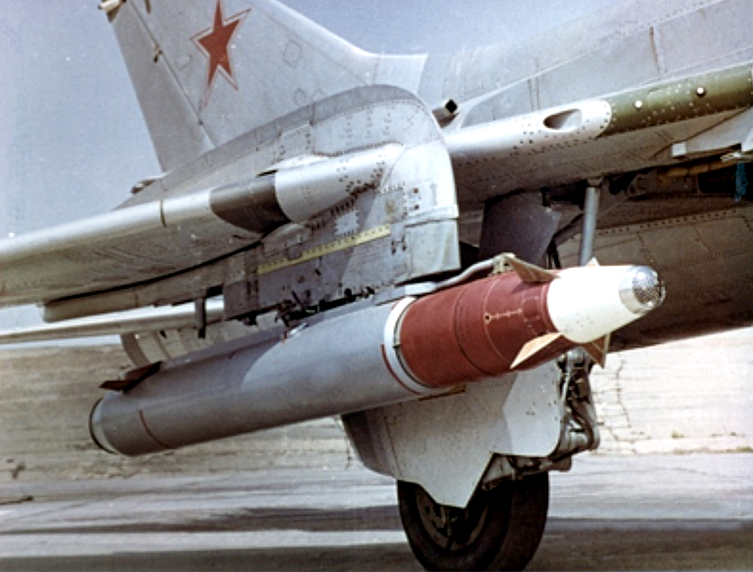 Variants of Soviet era strike aircraft such as the MiG-27 Flogger, Su-17M and Su-22M Fitter carried nose mounted optical target tracking sensors with boresighted laser designators, for targeting weapons such as the Kh-25ML series. Kh-25ML training round on display at Vinitsa in the Ukraine, on an Su-24 Fencer (Wikipedia image). Phazotron PSM-E series Ku-band MMW active radar seeker developed for the Kh-25MAE (via Missiles.ru). 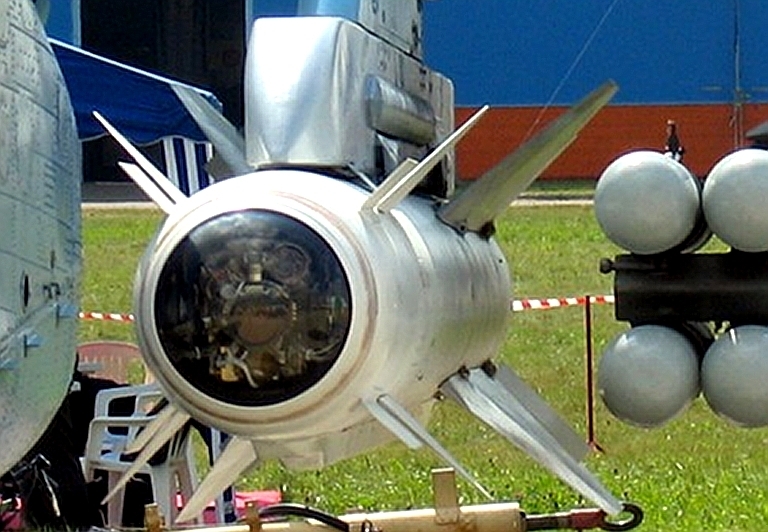 The Kh-25MAE variant employs an inertial navigation system and an unspecified active radar seeker, it is intended for attacks on a wide range of surface targets including vehicles, parked aircraft, helicopters, C3 targets, POL targets and structures, under day, night and adverse weather conditions. The seeker is an MMWI Ka-band design, the PSM-E developed by Phazotron, and is comparable to the seeker in the US AGM-114L MMW Hellfire variants, but with a narrower antenna scan angle and larger aperture. The manufacturer has published numerous discussion notes extolling the virtues of MMW seekers for this specific application. Сектор обзора — по азимуту, град. The Kh-25MSE is equipped with an unspecified satellite navigation receiver and inertial measurement system, and a differential satellite navigation beacon receiver. The missile uses satellite navigation signals and ground station differential correction messages to fly a programmed trajectory to an aimpoint loaded into the missile before launch. This provides the weapon with a genuine all weather blind attack capability similar to US weapons like the JDAM. Existing Russian satellite navigation receivers such as the PSN-2001 series are designed to track both GPS C/A and Russian Glonass signals. The use of differential ground station beacons provides this weapon with potential to achieve CEPs better than many conventional seeker types provide. Kh-25MP / AS-12 Kegler anti-radiation missile, equivalent in many respects to the US AGM-45 Shrike anti-radiation missile (© 2009, Miroslav Gyűrösi). 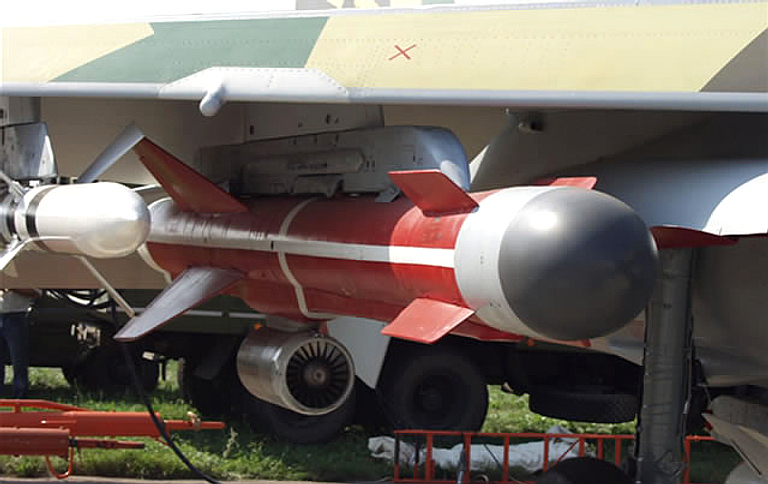 The Kh-25P and more recent Kh-25MP variant are anti-radiation missiles based on the Kh-25M airframe. The are intended due to limited range primarily as reactive defensive weapons for suppression of terminal and battlefield air defences, especially SAM systems and SPAAGs. The missile is equipped with a band specific PRGS-1VP or PRGS-2VP anti-radiation homing seeker. Post launch the missile seeker is programmed to climb along a logarithmic trajectory until the seeker depression angle to the target emitter is 27º, at which point the missile pitches down, transitions to terminal homing in azimuth and elevation, and dives into the target emitter. The Kh-25 is typically operated in an LOBL regime, with the seeker capable of autonomous search while being carried on the APU-68 or APU-68UM launcher. The PRGS-1VP searches a 60º angular sector in azimuth for threat emitters, and once locked can track the emitter at a rate of up to 6º/s. The PRGS-2VP can track the emitter at a rate of up to 8º/s, through elevation angles of +20º to -40º. 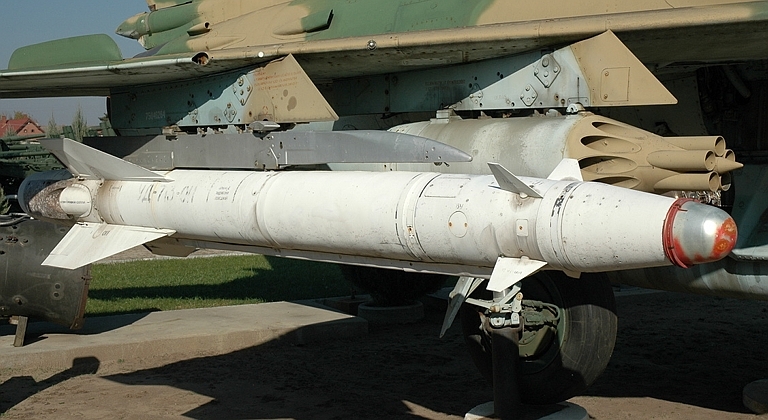 Kh-25MP / AS-12 Kegler anti-radiation missile (image Said Aminov). 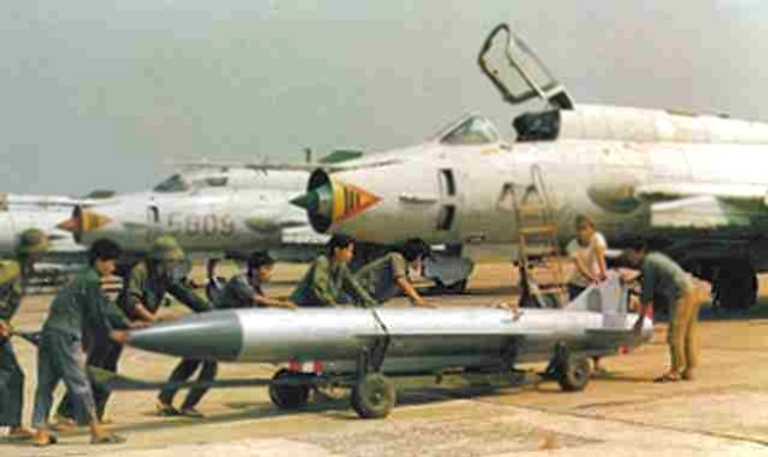 Su-17M4 Fitter of the PAVN being loaded with a Kh-38 missile. The Raduga Kh-28 / AS-9 Kyle was the first specialised high performance anti-radiation missile built by the Soviets, with development initiated during 1963. The intended launch platform was the Yak-28 Brewer, used by Frontal Aviation as an electronic combat aircraft. 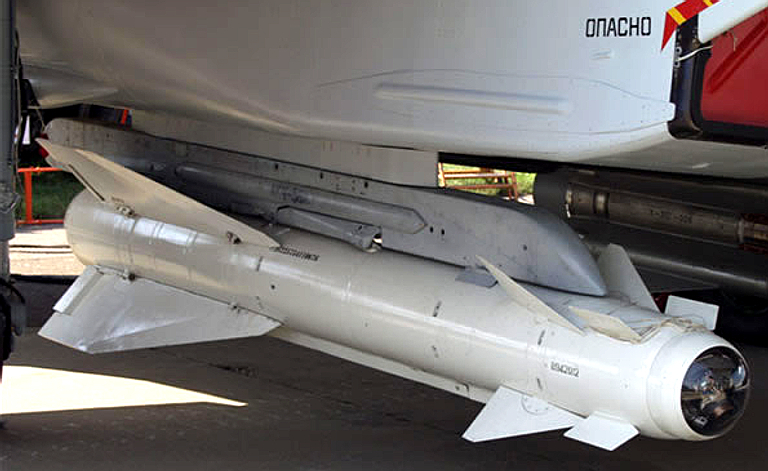 The design of the new missile was based on Raduga's much larger Kh-22 / AS-4 Kitchen and KSR-5 / AS-6 Kingfish. The result of the decision to build the weapon as a scaled down derivative of existing liquid fuelled missiles was an unusually complex and densely packed design, which used the R-253-300 engine used in the KSR-5, using the toxic, corrosive and difficult to handle AK-20F/TG-02 hypergolic fuel mix. 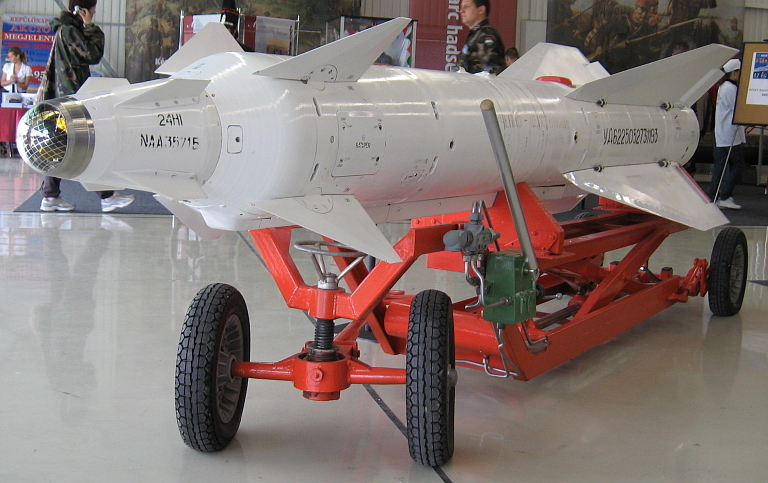 The Avtomatika PRG-28 anti-radiation seeker also proved troublesome to develop, and band specific variants were produced to defeat specific NATO SAM systems. 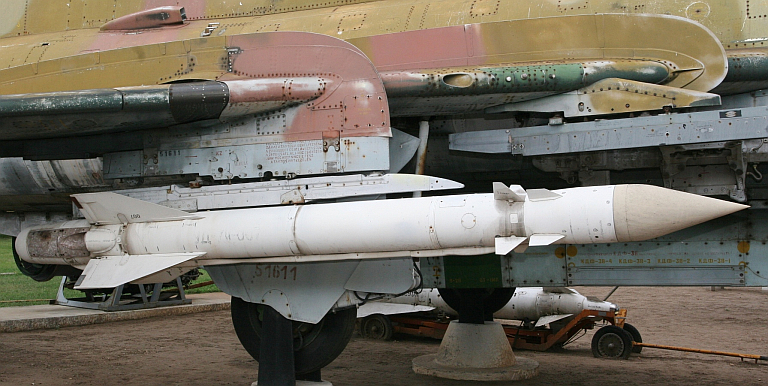 The missile entered service during the 1970s, but was too heavy for the underpowered Yak-28 Brewer, and was redeployed on the Su-17M Fitter and Su-24 Fencer which had the performance to carry a pair of these missiles. The ventral stabiliser prevented carriage under the fuselage. The weapon was targeted using a podded Metel A/B homing receiver on the Fitter or Flogger, or the internal Filin N homing receiver in the Fencer. While the missile was fast and long ranging, it was complex and difficult to maintain, and quickly superceded by the newer and easier to maintain solid propellant Kh-58 missile. The Kh-28 was exported to Iraq and Syria but it is not known whether either were able to successfully operate it. 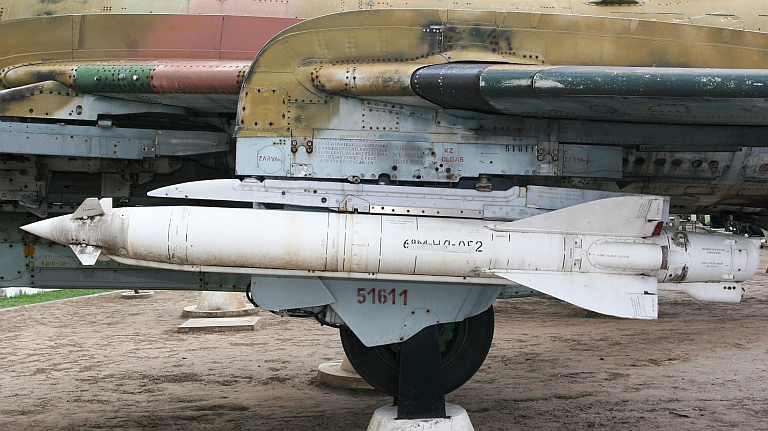 Iraqi propaganda images of Kh-28 missile, painted in non-standard livery. Captured Iraqi Kh-28 in 2003 (US DoD). While the Kh-28 was not entirely effective operationally, it is interesting technically as it is the smallest high performance liquid rocket propelled missile the Soviets mass produced. The PRG-28/28M seeker was installed in the nose. 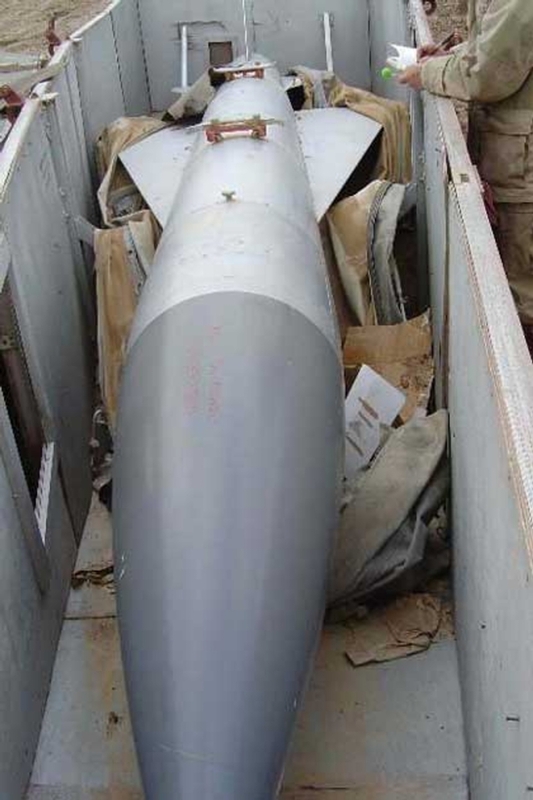 The large 140 kg 9A283 warhead was installed behind the seeker, its size was a byproduct of the poor achievable CEP of the seeker. 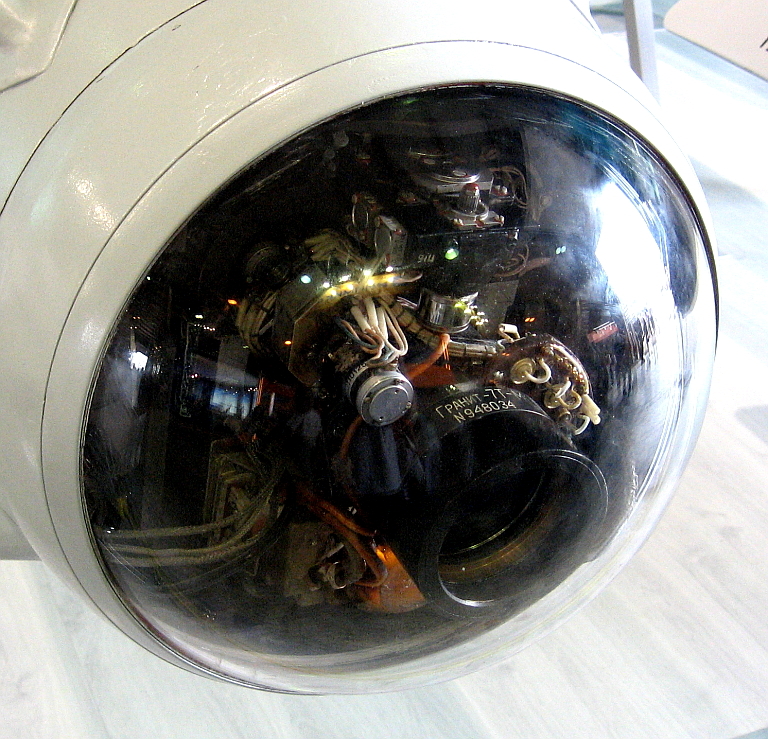 An ROV-5 proximity fuse was used, with a backup impact fuse and a timed self destruct system. The large fuel and oxidiser tanks occupied the centre fuselage, with the APR-28 autopilot in the aft fuselage. The R-253-300 engine produced 8,000 kp of thrust during the boost phase before throttling back for cruise. Operation of the missile required fuelling and defuelling the rounds due to the poor storage behaviour of the fuel components, this in turn requiring the use of chemical suits and neutralising flushes of the fuel system. Vympel Kh-29 Kedge ASM (Wikipedia image). The Kh-29L (Izdeliye 63 or AS-14A) is a semi-active laser homing variant used in the manner of the AS.30L, with a 24N1 seeker. 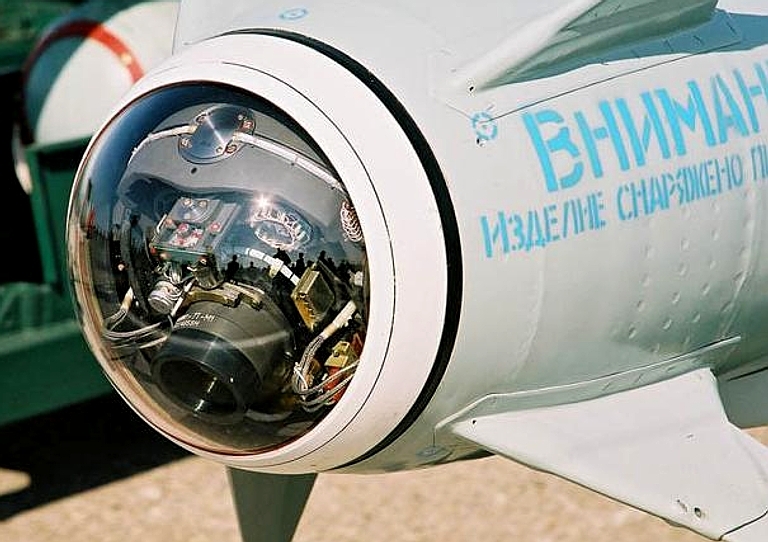 The Kh-29T (Izdeliye 64 or AS-14B) is an electro-optical variant with a daylitgh television seeker. The Kh-29TE is the export variant, the Kh-29TM an enhanced variant. The Kh-29TD is another EO variant, possibly equipped with a thermal imaging seeker. Kh-29TE on the inlet station of an Su-35 demonstrator (KnAAPO image). Kh-29L semi-active laser homing seeker. Kh-29T T-2 series daylight television seeker. Above, below: KnAAPO/Sukhoi Su-30MK Flanker G firing Kh-29 Kedge ASMs. The Mach 4.5 ramjet Kh-31 / AS-17 Krypton family of missiles includes anti-radiation, anti-shipping and claimed anti-AWACS variants. 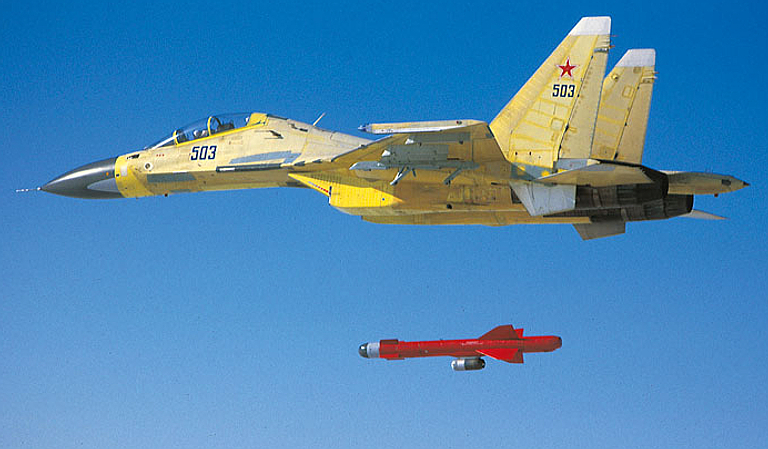 Reports claim the PRC intends to licence build this weapon, depicted with an Su-30KN prototype (KNAAPO). Dubbed the 'Mini-Moskit', the supersonic Turayev ramjet powered Kh-31P (AS-17 Krypton) was originally designed as an anti-radiation missile to suppress NATO Patriot and I-Hawk batteries, entering use in 1988. The powerplant arrangement uses a solid rocket booster in the tail to accelerate the vehicle to ramjet ignition speed. Once the propellant is expended, the booster cavity is employed as a combustor cavity for the kerosene fuelled ramjet which is used to continue accelerating the missile to cruise speed and then sustain that speed until the liquid fuel is expended. The missile's combination of high speed, small size and long range makes it a challenging target to intercept by air defences. At altitude the Kh-31 achieves Mach 4.5, as sea level Mach 2.7. Su-30MK fitted for the Kh-31 series carry up to six rounds on wing stations 3, 4, 11, 12 and inlet stations 9 and 10, using AKU-58 adaptors, the Su-27SKU four rounds on 3, 4, 9 and 10. It has no equivalent in the Western inventory, the US Navy using it as the MA-31 target drone. The PLA is reported to use this weapon with recent claims of plans for licence production as the YJ-91 series. During the 1990s there were persistent claims that the airframe was being adapted for use as a long range AAM with a Counter-ISR role, as an “AWACS-killer”, with the designation R-31P. The reality is that both the anti-radiation and anti-shipping variants of the extended range configurations of this missile have compatible 135 NMI plus range on high altitude trajectories, and suitable basic seeker technology, and both have a suitable laser proximity fuse. Adaptation for an air - air role of this kind would involve primarily changes to the control laws in the guidance and proximity fusing timing parameters. It is entirely conceivable that such a Counter-ISR capability already exists embedded in newer variants of the missile's guidance system. 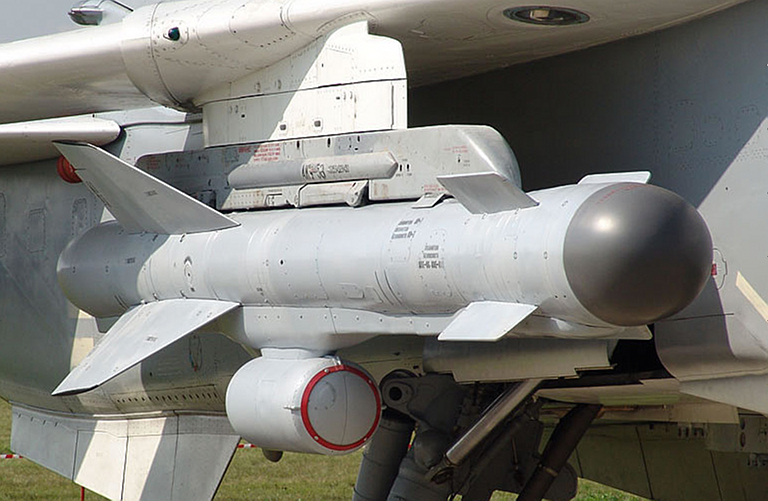 The Kh-31P is the basic anti-radiation variant of the missile with a band specific Avtomatika L-111E family interferometric seeker, which uses an array of seven cavity back spiral antennas on a gimballed platform. The seeker can home on pulsed or CW emitters. 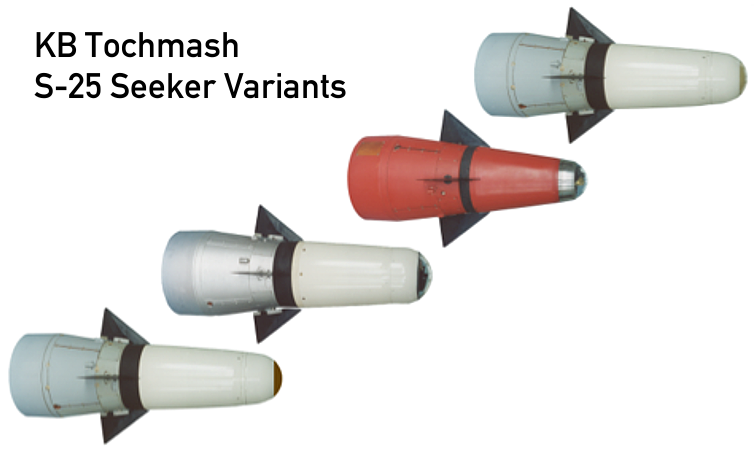 Unique missiles are supplied with band specific seekers and these must be chosen during sortie planning. 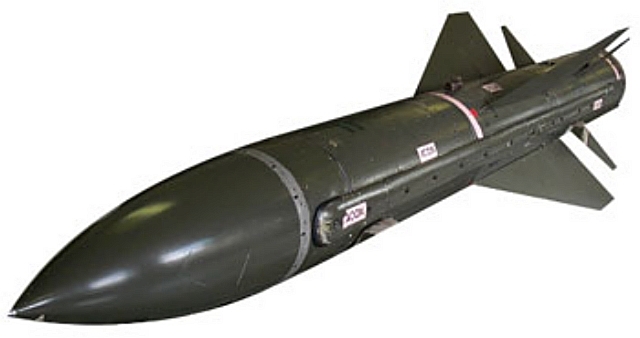 The Kh-31PK is an improved Kh-31P with an more effective warhead and a proximity fuse intended to increase lethality. The Kh-31PD is a stretched extended range variant of the basic design. There are claims that this variant exploited work performed by Boeing on adapting the Kh-31 as the MA-31 target. Cited range of this variant is more than twice that of the basic missile, using an improved 31DP ramjet and increased fuel tankage. The design employs an improved TsKBA Omsk Avtomatika L-130 wideband seeker, likely providing coverage between 1 to 11 GHz. A 110 kg submunition dispensing warhead is optional. Носители Су-30МК (МКИ, МКМ, МК2), Су-35, МиГ-29К, МиГ-29КУБ, МиГ-35 и др. Avtomatika L-112E anti-radiation seeker. This family of seekers employs a characteristic gimballed multiple baseline interferometer design which uses a cluster of seven wideband hemispherical spiral antennas, providing for pitch/yaw steering outputs and ambiguity resolution in both axes (© 2009 Vitaliy V. Kuzmin). 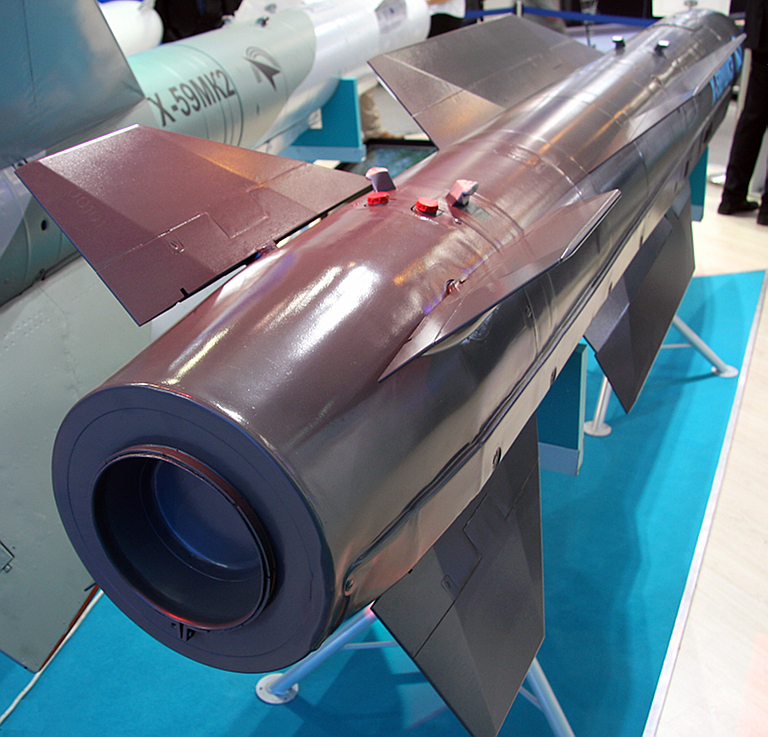 The Kh-31A is a high speed anti-shipping missile based on the Kh-31P airframe, but equipped with a new Leninetz RGS-31 active radar homing seeker. The design of the seeker is frequently credited to Radar MMS, its cardinal parameters are similar to the Radar MMS designed ARGS-35 in the SS-N-25 Switchblade and ARGS-54 in the SS-N-27 Sizzler. The missile is fitted with a KTRV-Detal A-069A radar altimeter, which operates at altitudes between 100 metres and 6,000 metres,. Russian sources claim the weapon has been exported to China, India and Vietnam. The seeker can be locked onto the target before launch, or acquire the target post launch, to maximise operational flexibility. The Kh-31AD is a stretched extended range variant of the Kh-31A with an enlarged warhead. The improved Leninetz ARGS-31E active seeker can acquire over a wider field of regard and operates in sea states 4 to 5. Разработчик ОКБ "Звезда" Корпорация "Тактическое ракетное вооружение"
Изготовитель ГНЦП "Звезда-Стрела" Корпорация "Тактическое ракетное вооружение"
- максимальная по целям типа "эсминец"
- максимальная по целям типа "ракетный катер"
Разработчик холдинг "Ленинец" холдинг "Ленинец"
Носители самолеты Су-30МК (МКИ, МКМ, МК2), Су-35, МиГ-29К, МиГ-29КУБ, МиГ-35 и др. 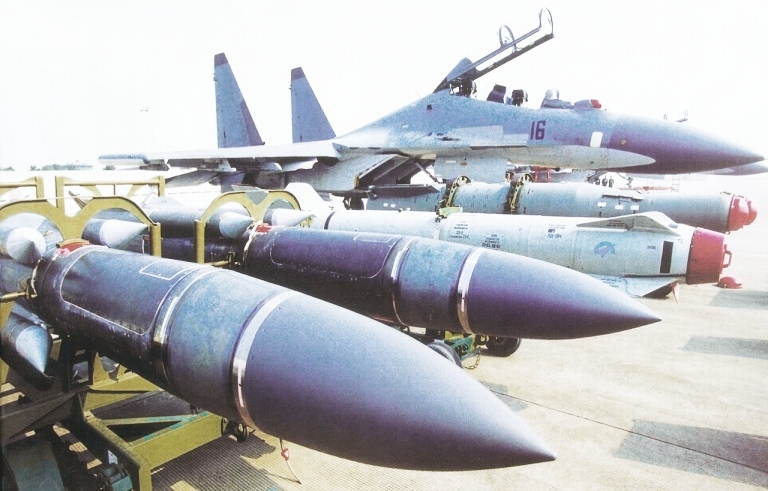 Kh-31P / AS-17 Krypton carried by an Su-30MK (KnAAPO image). Kh-38 mockup on display. 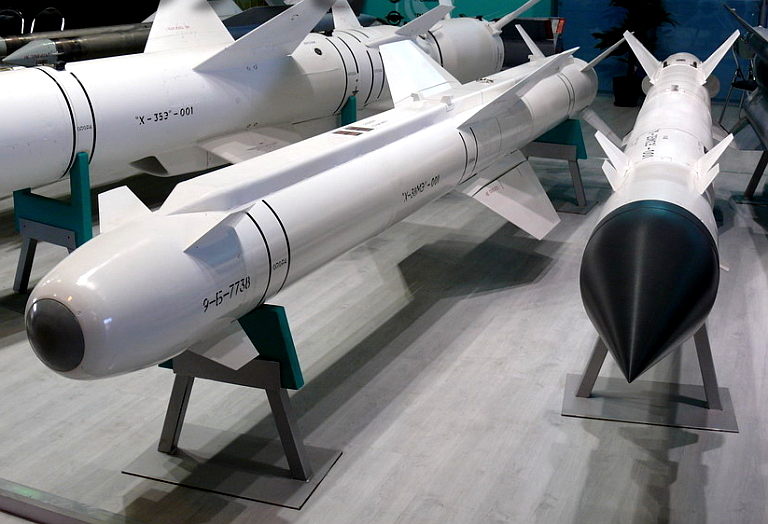 To the right a Kh-25MP / AS-12 Kegler anti-radiation missile, which the Kh-38 is intended to replace (image Said Aminov). The new Kh-38 family of missiles was developed to replace the 1970s technology Kh-25 /AS-10 Kerry family of battlefield interdiction and close air support weapons, but with an expanded target set. Kh-38MLE with inertial midcourse and semi active laser terminal homing guidance. Kh-38MAE with inertial midcourse and active radar terminal homing guidance. Kh-38MTE with inertial midcourse and thermal imaging terminal homing guidance. Kh-38MKE with satellite aided inertial midcourse guidance. Warhead options include a blast-fragmentation type or penetrator type for all variants, and a submunition dispenser type for the satellite aided inertially guided Kh-38MKE. Kh-38ME mockups on display at MAKS 2009, with radar and EO seekers. Note the folding wings for compact or internal carriage (© 2009 Vitaliy V. Kuzmin). KTRV Kh-58UShKE Kilter anti-radiation missile. Note the significantly revised radome and cruciform wing design of this recent variant (© 2009 Vitaliy V. Kuzmin). 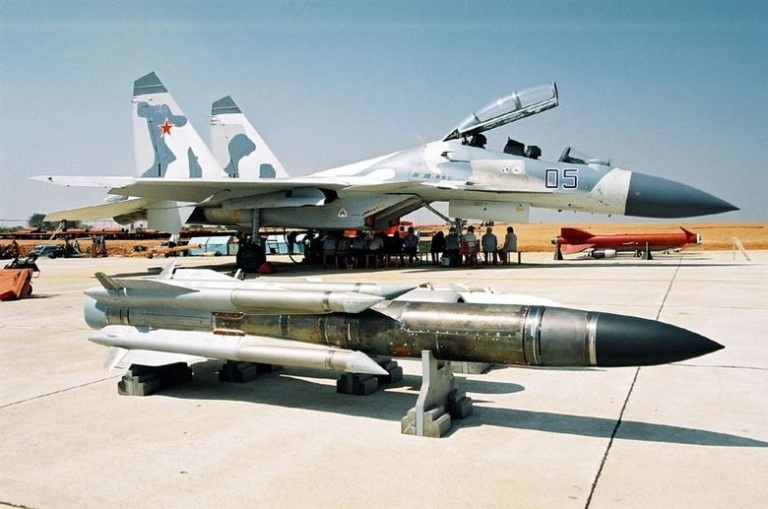 The Item 117 / D7 / Kh-58 anti-radiation missile was developed during the 1970s to arm Soviet Frontal Aviation defence suppression aircraft, especially the newly developed MiG-25BM Foxbat. The design was clearly inspired by the joint UK-French developed HS-Matra Martel series, as the Soviet design is almost identical in configuration, cardinal design parameters and size. The Kh-58 was later integrated on other strike aircraft, specifically the Su-24 Fencer, the Su-17/22 Fitter, and Su-25 Frogfoot, these requiring an external emitter locating pod such as the Vyoga or Fantasmagoria. IOC was attained in 1982. The Kh-58 airframe uses 30KhGSA stainless steel extensively, and OT4-1 titanium alloy is employed for the wings and tail surfaces. The Avtomatika PRGS-58 anti-radiation homing seeker is mounted in the nose, its generates steering signals for the SAU-58 guidance, which also uses inertial unit inputs for midcourse guidance. The 149 kg blast-fragmentation warhead employs an ROV-20 active laser proximity fuse with a backup contact fuse, both armed by the guidance unit. The rocket motor develops 6,000 kp of thrust during the initial boost/climb phase, and once this 3.6 sec burn is completed the sustain phase thrust rating of 1,000 kp is produced until burnout. The Kh-58 can be carried externally using the AKU-58 launcher, or internally using the UKVU-50 ejector. In a typical delivery profile the missile flies a semi-ballistic trajectory on inertial guidance, switching to passive anti-radiation homing as it nears the target emitter. A number of distinct variants exist. The baseline Kh-58 introduced during the Cold War had a cited range of up to 120 km. It was replaced by the improved Kh-58U which had a better PGS-58M seeker and a range of up to 250 km for a high altitude supersonic launch. 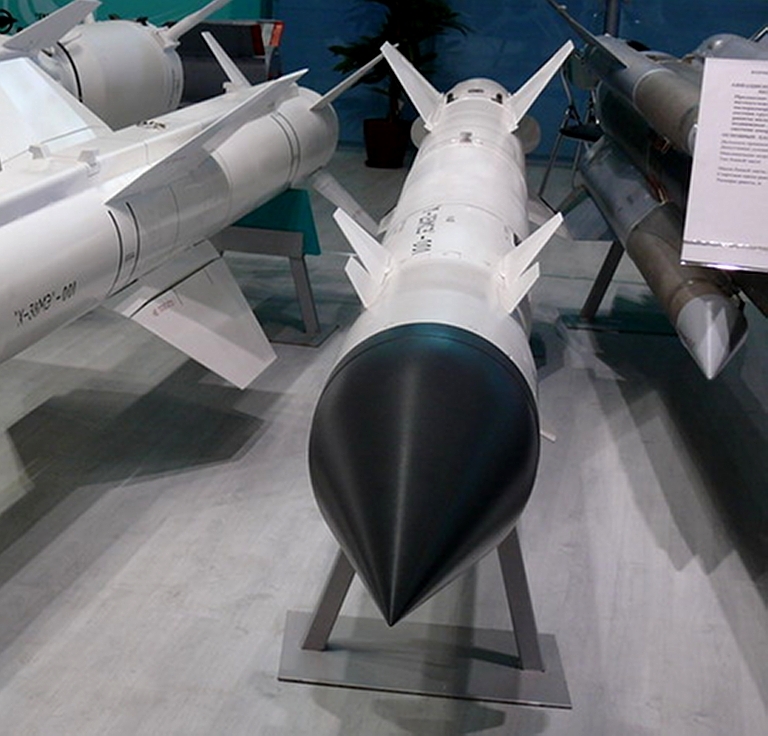 The current production Kh-58E export variant has a range of 200 km, subject to launch conditions, and likely employs the engine developed for the Kh-58U. The weapon has been integrated on the new MiG-31BM Foxhound variant. An anti-shipping variant equipped with an active radar seeker and analogous to the Matra-BAe Sea Eagle has been proposed. The latest export variant offered is the Kh-58UShKE, which is slightly shorter than the Kh-58E, uses shorter span wings, and has a range of up to 245 km. It is equipped with a new wideband seeker design capable of acquiring emitters operating between 1.2 and 11 GHz, and can also home on CW (continuous wave) emitters in one band. KTRV Kh-58UShKE Kilter anti-radiation missile. The aligned join in the wings and tail surfaces suggests a folding design for internal carriage (© 2009 Vitaliy V. Kuzmin). 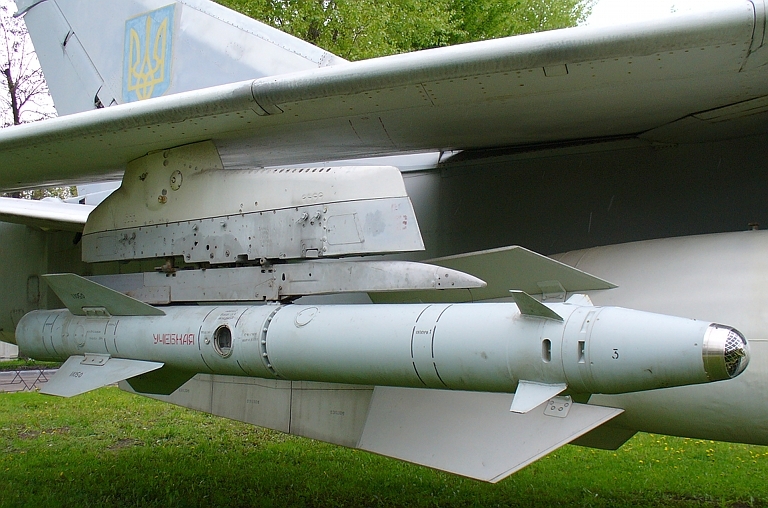 Raduga Kh-58 Kilter anti-radiation missile. Foxbat F. The Soviet answer to the Wild Weasel F-4G, the Foxbat F is essentially a Foxbat D fitted with a radar homing system to support four AS-11 Kilter ARMs. 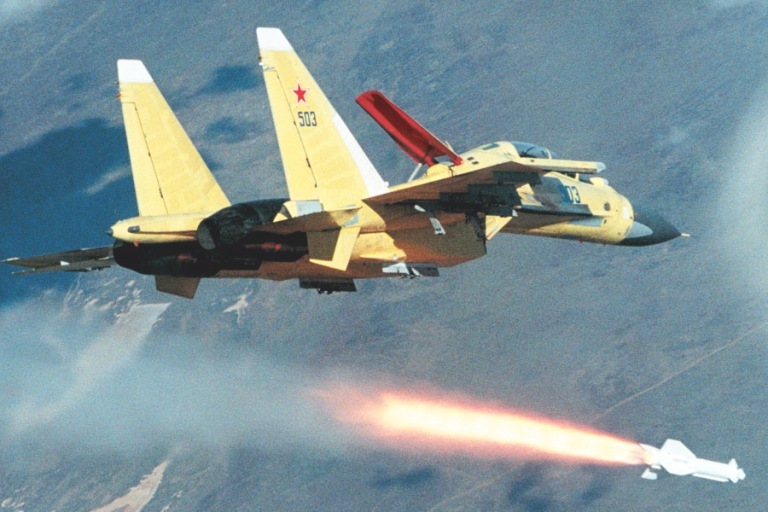 With high dash speeds the Foxbat F can punch through a CAP barrier and fire its ARMs before defending fighters can reengage, and in the high density European theatre envisaged in the eighties, it was a potentially very useful asset. Kh-58 carried by Su-25 Frogfoot. MiG-31F Foxhound demonstrator with Kh-58U under left wing and Kh-31P under right wing. This design is the basis for the current digital MiG-31BM variant. 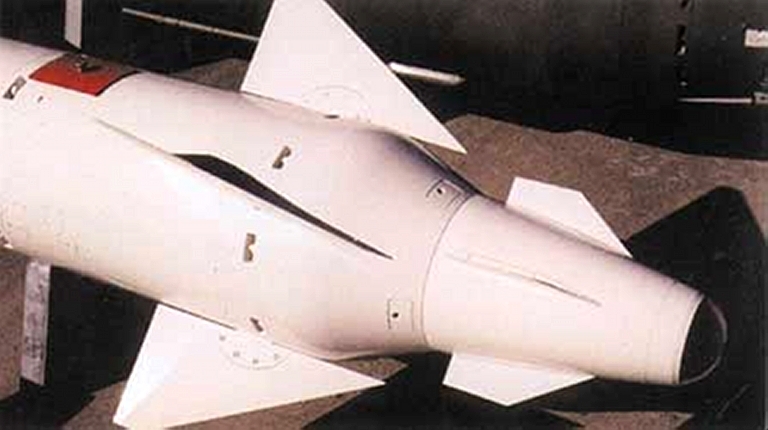 The Kh-58 is modelled on the UK/French Martel/ARMAT anti-radiation missile design, above, and is almost identical in size, warhead mass and aerodynamic configuration. Kh-59 Ovod / AS-13 Kingbolt (left), APK-9E datalink pod (centre) and Kh-29TE / AS-14 Kedge TV guided variant. Both share the same EO seeker design (right). The Raduga Kh-59 Ovod / AS-13 Kingbolt was developed to provide a standoff weapon capable of operating in heavily jammed environments. It is a direct equivalent to the AGM-142 Popeye series of standoff weapons carried by Israeli F-16Cs, US B-52H and Australian F-111C. Initial development envisaged a television and datalink guided weapon similar to the HS-Matra TV Martel, using the Kh-58 / AS-11 Kilter airframe and Kh-29TE Tekon-Elektron Tubus-2 / Granit 7T-M1 television seeker system, but this idea was abandoned due to the long range high speed high altitude profile airframe and propulsion optimisation of the Kh-58. The new missile needed to perform better at lower altitudes and speeds, and provide a range of at least 40 km. The subsonic missile design employs two solid rockets for propulsion, a tail booster, and a fuselage sustainer with a pair of nozzles exhausting from the sides of the fuselage. Once the booster burns out it is jettisoned, exposing the radome for the missile datalink, which carries TV imagery to the launch aircraft and receives operator steering commands, both using the Raduga APK-9E Tekon pod. Missile control is effected by trailed edge surfaces in the cruciform tail, with distinct folding canards used for stability. The missile airframe is constructed with stainless steel and light alloys. An AKU-58-1 launcher is used. The Raduga APK-9E Tekon pod employs a number of key components no longer built by Tekon-Elektron in the Ukraine. These include the X-band 1DV1-401AMK pulse mode command uplink transceiver and its gimballed and stabilised antennas, the SB-1A solid state FMCW analogue TV downlink transceiver, the PK-9M pod and the IT-23M cockpit display for the system. 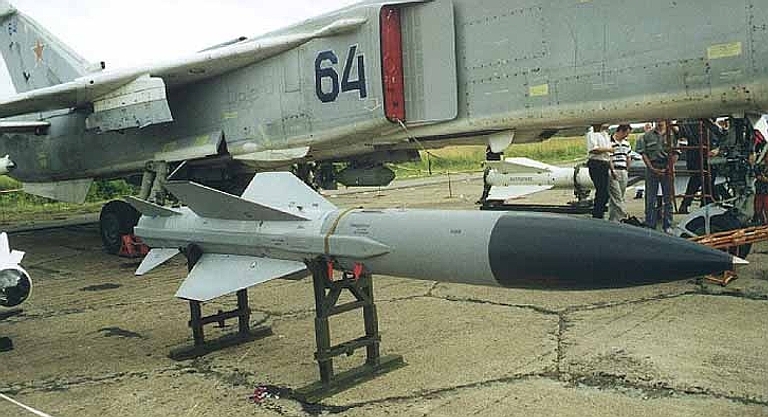 The principal launch vehicle for the Kh-59 is the Su-24M Fencer. Above, below: the Ukrainian Tubus 2 / Granit 7T-M1 gimballed electro-optical seeker is used on a number of Russian guided munitions (via Russian Internet). The 2,000 lb (920 kg) 62 NMI (115 km) range Kh-59M/D (AS-18 Kazoo) series stand-off weapon evolved from the earlier rocket powered Kh-59 / AS-13 Kingbolt missile. It shares the common Tekon-Elektron Tubus 2 / Granit 7T-M1 optical seeker and Raduga / Tekon-Elektron APK-9 Tekon series DL pod with the earlier weapon. The most prominent design change is the installation of a ventral RDK-300 turbojet sustainer in a pod similar to the design in the Kh-55 cruise missile, replacing the rocket sustainer and its side mounted exhaust nozzles. The autopilot can be programmed for clearance altitudes of 50, 100, 200, 600 or 1000 m AGL, or 7 m AMSL. The missile is fitted with a KTRV-Detal 3A-81G radar altimeter, similar to the design used in the 3M80 / SS-N-22 Sunburn. The weapon has been widely exported to arm Flanker variants. 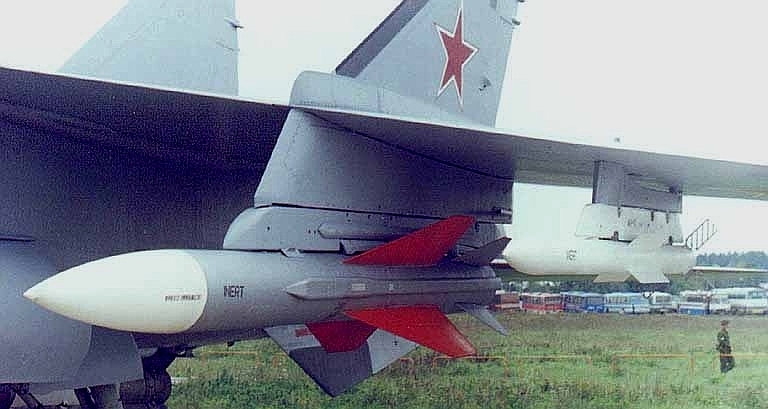 The Su-27SKM/30MK fitted for the Kh-59M/MK2 carry two rounds on wing stations 3 and 4, using AKU-58 adaptors, the pod carried on inlet station 9. The APK-9 series datalink pod is 4 metres long, has a diameter of 0.45 m, weighs 260 kg, and has a range of 140 km using nose and tail mounted antennas. A number of distinct variants have been developed since this weapon was introduced to FA-VVS units during the late 1980s. 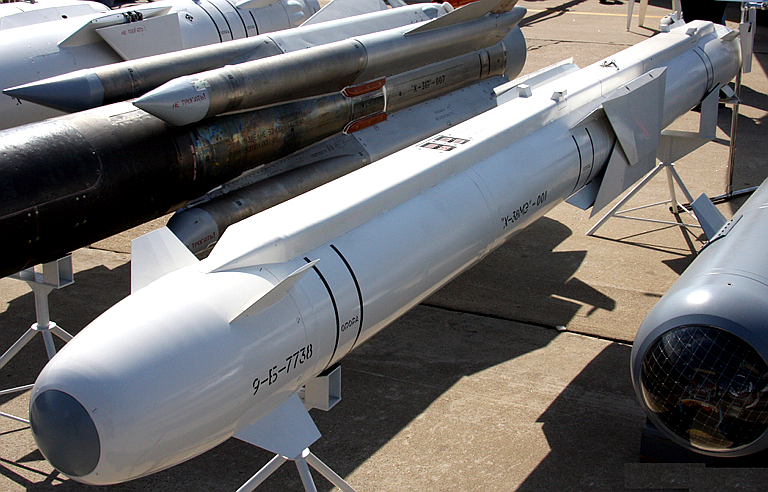 The Kh-59ME is the export configuration of the basic missile. 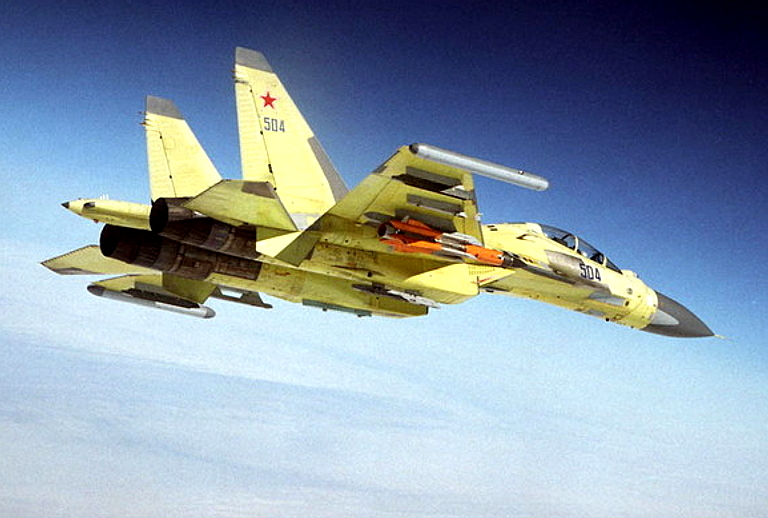 It has been exported to most users of the Su-30MK and remains on offer as a production item in 2009. The Kh-59M2E is an improved variant with a stated night attack capability, although whether this was achieved by installing a low light capable CCD imager or by a complete optical system replacement with a gimballed thermal imager has not been disclosed to date. Claimed CEP is ~2-3 metres. The improved APK-9ME pod is used. It is likely that both the seeker and datalink pod designs for this variant are substantially new, and replacements for Ukrainian built hardware no longer in production. Kh-59ME Ovod M / AS-18 Kazoo and APK-9 Tekon pod on Su-30MK (KnAAPO image). Kh-59MK2 / AS-18 Kazoo anti-shipping variant. The Kh-59MK2 was developed with PLA-N funding to arm the Su-30MK2 Flanker G variant delivered to PLA-N naval strike wings. It has since been offered for export to other clients, in competition with the Kh-25E/UE Switchblade. The design changes are substantial, with the original folding high aspect ratio canards replaced by a strake like cruciform canard stabiliser. The electro-optical seeker is completely replaced with a new Radar MMS developed ARGS-59E active radar seeker designed for attacks on shipping or other high radar contrast targets. Stated range performance for this variant is 285 km. The missile is fitted with a KTRV-Detal A-079E radar altimeter. Su-30MK Flanker G launching a Kh-59MK2 trials round. Note the deployed trapeze launcher arms (KnAAPO image). Su-35S demonstrator with a Kh-59MK2 round (KnAAPO image). 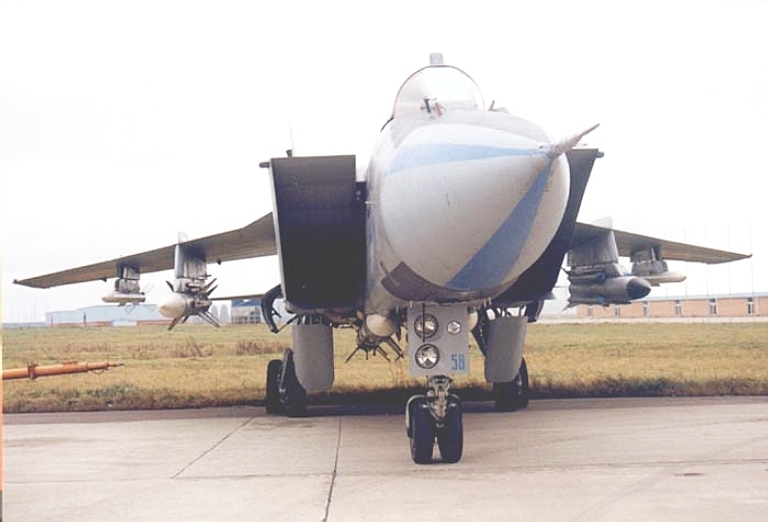 Kh-59MK prototype for the PLA-N Su-30MK2, carried on an Su-24 Fencer. Kh-31P / AS-17 Krypton ASMs, Kh-59 / AS-13 Kingbolt ASM, and KAB-1500Kr EOGB.